The Mojave Desert Land Trust (MDLT) is offering the public guided hikes, primarily in Joshua Tree National Park. The hikes are $10 for MDLT members and $25 for non-members. 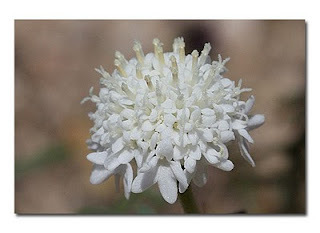 The late March hikes (during the predicted wildflower peak season) will probably go fast! You can get more information at their website. Looking over the proposal for the Abengoa Solar's Mojave Solar project description indicates that this plant would use water cooling as opposed to the far more eco-friendly dry-cooling technology proposed in a number of other solar plants. Just how much water are we talking about? According to Abengoa Solar, approximately 1,077 acre-feet of water per year for each plant site. There will be two plant sites. I had to look it up myself, but a single acre-foot of water is equivalent to 325,851 gallons of water. In total, Abengoa's project would consume nearly 350 MILLION gallons of water. I had to check my math twice. For those that can make it, the California Energy Commission just posted a notice that the BLM will hold an open house at its Field Office in Needles, California to address questions regarding the Ivanpah Solar Electric Generating System. Copies of the Draft Final Staff assessment and the Draft Environmental Impact Statement will be available. This open house will also be a good chance to pose some questions regarding the BLM's holistic approach toward utility-scale solar energy siting and how it plans to balance preservation of desert wilderness and renewable energy needs. The event will be held on 04 February, from 2-4 pm. The point of contact for the event is Tom Hurshman, BLM Project Manager who can be reached at (970) 240-5345. The announcement is posted on the CEC website and you can read about the Ivanpah project debate in my previous posts. If you're looking for a good day hike, try Teutonia Peak trail located in the northern portion of Mojave National Preserve. The photo above was taken from the trail, with a portion of the Cima Dome in the distance. San Bernardino County Easing On ORV Rules? As soon as 26 January(delayed vote) the San Bernardino County supervisors may vote to repeal an existing county ordinance (Ordinance 3973) that requires a permit for gatherings of 10 or more Off-Road Vehicle users on private property. This issue should fall into the property rights and public nuisance debate more than a Mojave Desert wilderness preservation issue, but it's a good hook to examine the current state of regulation and enforcement in ORV use in the Mojave Desert area in general. For those note in Southern California this week, the Mojave Desert is receiving a good soaking from mother nature, hopefully boosting our chances for a colorful spring. Here is a shot of Kelso Dunes taken from the Quail Basin trail head on 16 January -- just a day before the storms hit. According to someone testifying to protect rare natural resources in the Mojave Desert at the California Energy Commission (CEC) evidentiary hearings for the Ivanpah Solar Electric Generating System (ISEGS), the 11 January CEC hearing for the Ivanpah Solar Energy site lasted until nearly 10:30pm, and covered visual resources and the impacts on wildlife. Today's hearing was scheduled to address botanical resources, which may present the greatest challenge to the CEC and BLM's consideration of granting right-of-way to BrightSource Energy, since the site selected by BrightSource happens to host several sensitive and rare plants. Unfair Zoning in Fairview Valley? An article in the Victor Valley Daily Press recently highlighted that 11 January was significant for another reason in the Mojave Desert (for the other reason, read here). 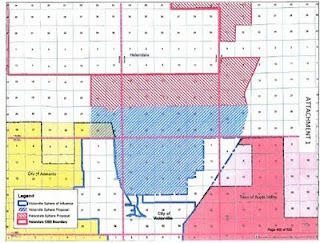 The San Bernardino County Board of Supervisors designated 11 January as the last day for the public to comment on the environmental impact statement for the proposed development of a sub-division in Fairview Valley, located within the Apple Valley sphere of influence but in area where humans are outnumbered by Jackrabbits. The Strata Equity Group proposes building nearly 3,000 homes in the area over the next 20-25 years, which would severely burden city services, existing transportation infrastructure, and add noise and air pollution. 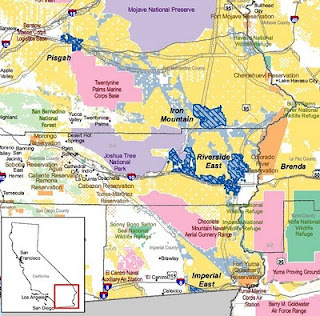 The overall impact would be a dramatic shift for the way of life of current Fairview Valley residents, who cherish the seclusion and open vistas of the Mojave Desert on the fringes of the Victor Valley. For the many that were not able to attend the 11 January California Energy Commission (CEC) hearing addressing the Ivanpah Solar Energy hearing today, we will have to wait until the staff posts the comments and outcome of decisions regarding the impact of the Ivanpah site on the Mojave Desert's biological resources. A review of the CEC Staff's initial rebuttal to the comments from BrightSource Energy request to water down many of the requirements holds promise that, even if Ivanpah is allowed to move forward, neither the State or the BLM will subsidize BrightSource for their poor choice in locations. 1.) Desert wildflower watchers are forecasting a great spring for the desert blooms. You can read up on regular status reports on DesertUSA. You can also learn more about blooming periods by region at the Digital Desert's website. 2.) The New York Times Greenwire Blog posted an assessment of Feinstein's proposed California Desert Protection Act 2010 (CDPA 2010), emphasizing the legislation's intention to encourage more renewable energy development on military bases in the Mojave Desert (Fort Irwin, 29 Palms, Edwards AFB). 3.) A bird count sponsored by the National Audobon Society at Joshua Tree National Park counted a total of 3,067 birds across nearly 50 different species according to the Hi-Desert Star. CDPA 2010: Product of NIMBY Environmentalists? One of the dynamics that will inevitably unfold over the next year--assuming Senator Feinstein is able to get her proposed California Desert Protection Act 2010 before Congress for a vote--will be opponent's attempts to frame CDPA 2010 as the product of Not In My Back Yard (NIMBY) environmentalists looking to shut out economic development. Read about early signs of opposition here. The portrayal of Feinstein's legislation by opponents almost certainly will over-simplify the field of stakeholders by labeling what is actually a diverse array of opinions as stubborn NIMBY environmentalists. Although you can count this blogger as an early supporter of the legislation's intent, I hope you never read anything on this blog that over-simplifies the arguments against CDPA 2010...if you do, call me out on it. Rep. Jerry Lewis Set to Oppose CDPA 2010? Congressional Representative Jerry Lewis (41st District) has expressed concern that Senator Feinstein's proposed California Desert Protection Act 2010 (CDPA 2010) locks up too much desert land from potential energy development, mining, and military training, according to the Hi-Desert Star website. Rep. Lewis' early opposition deserves some historical context. The early California Desert Protection Act of 1994 (which created the Mojave National Preserve and upgraded Joshua Tree and Death Valley to National Park status) lacked compromise with some stakeholders-- recreational users, hunters, and ranchers. Rep. Lewis took advantage of this and a hostile atmosphere toward environmental conservation among the newly empowered GOP-controlled congress to opposed the 1994 bill. 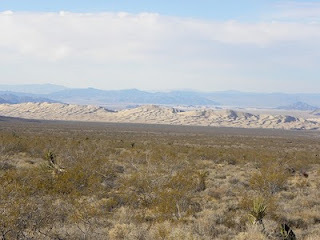 In the end, compromises were made and the 1994 CDPA passed, although Rep. Lewis budgeted only $1.00 to run the newly created Mojave National Preserve (MNP) in its infant years.